Deveno Landscaping is a family owned and operated company, established in 1991 to provide a better landscaping experience. Founder, David Deveno, was committed to giving every customer the information necessary to make smart decisions about their landscaping project. What began more than 28 years ago, with an old pickup truck and a 21-inch mower, has grown into a successful family-oriented landscaping company serving the Hampden County, and Southern CT areas. Feel free to introduce yourself to my wife Pam, our son Owen, myself and the rest of the team. The team is committed to complete customer satisfaction and will work hard to meet your expectations. 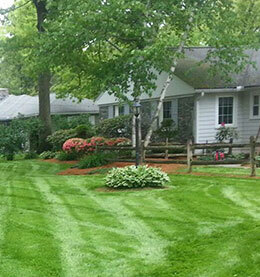 We are happy to consider all lawn and garden maintenance jobs both large and small.